Pre-written, Customizable, print-on-demand Training Materials that you can re-brand! Velsoft Instructor Guides are the core of each training course. Our Instructor Guides lay out the training in simple, easy-to-follow instructions. You can also customize the Instructor Guides in order to personalize your training. Each Instructor Guide - for each course - is paired with a Student Manual that you can present to your participants. This customizable Student Manual gives each participant the ‘student’ version of the course you will be teaching. Whether or not you choose to introduce exercises into your training is up to you as the facilitator. In case you want to do this Velsoft offers you an Exercise Workbook (also customizable) that is specific to the course you are offering. Velsoft likes to think that we've thought of everything. This includes preparing your PowerPoint slides for you in advance. Every Velsoft courseware title comes with a customizable Quick Reference Guide specific to that course. It idea is that you can provide this as a value-added handout to your participants. You will be surprised at how popular Quick Reference Guides are to your class. Promotional Advertorials are prepared for you in advance so that you can advertise your upcoming course or use the wording in other promotional activities. Story marketing is the process of attracting and engaging customers through story – their story, rather than yours. Instead of the ‘buy our product’ messages of typical marketing campaigns, story marketing tells the customer story and motivates them to connect with your company as a solution to their problem or a way to a better life. 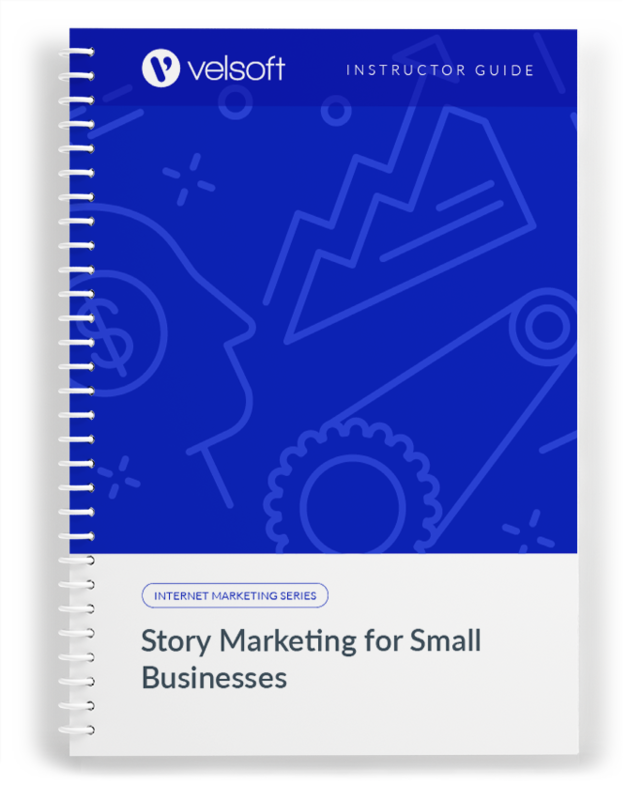 This one-day course highlights the essentials of story marketing for your small business: story marketing tools, storytelling basics, and how to write and refine your own story for marketing to your target audience. This one-day workshop will help you teach participants what story marketing is; how to recognize and use the essential tools of story marketing; the basics of good storytelling; ways to connect with your customers; how to refine your company brand for story marketing; and how to build and polish your own story for maximum results. All Velsoft training materials are fully customizable. Each package comes complete with an instructor guide, student manual, PowerPoint slides, quick reference guide, and much more. Try a free sample now! 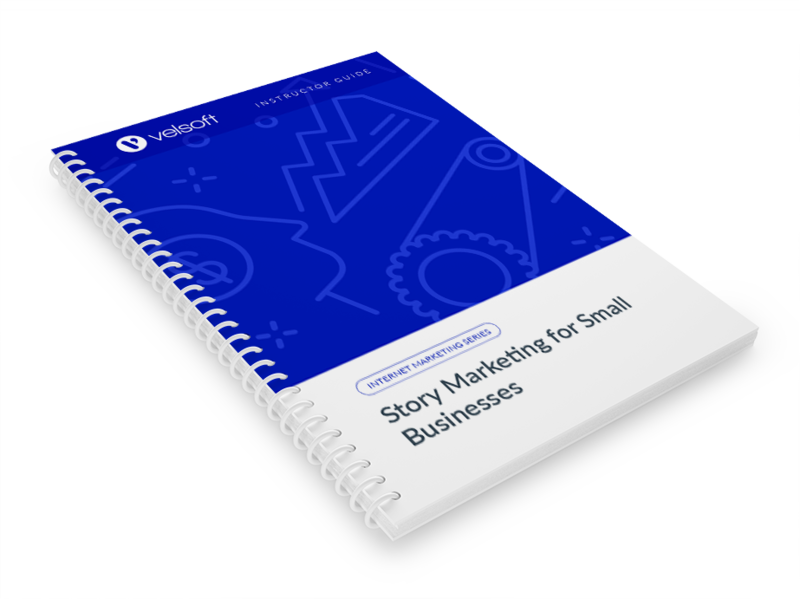 Story Marketing for Small Businesses is one-day course that provides your students with a comprehensive overview of the knowledge and skills need to ensure the viability of businesses in today's world. The course material applies equally to product and service-based enterprises. Tailor courses to suit the needs of your business, such as adding your company name and logo, or your own pictures. Print as many copies as you want, anywhere at any time. Your purchase gives you a perpetual license for your business. We offer a one-time payment model with a lifetime license. Each Velsoft courseware title comes with a Lab Workbook loaded with activities and exercises to practice and reinforce the learners' understanding of the course objectives. Pre-made Sample Exercise Files are provided for use with the Lab Workbook so that you, as the trainer, do not have to prepare activity working files. 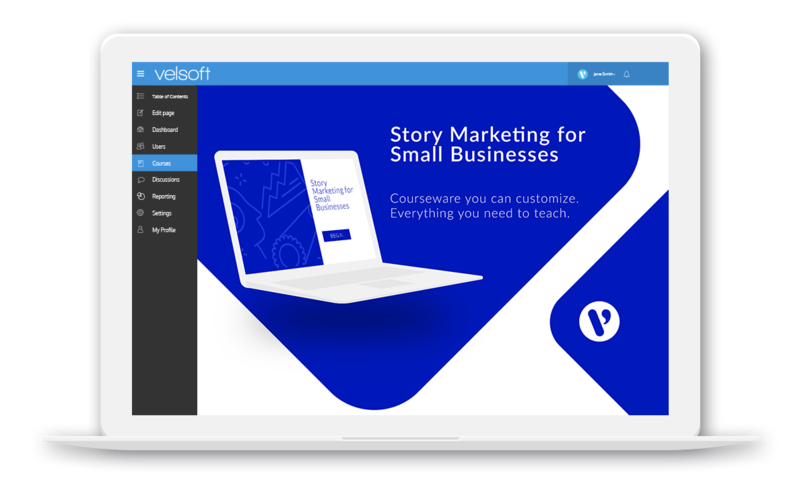 Courseware from Velsoft is designed to give you everything you need for use in the classroom or workshop. This includes the PowerPoint versions of all the courses, prepared for you in advanced. Quick Reference Guides are a favorite tool for trainers to provide to their learners. Each Quest Reference Guide summarizes the most important elements in each courseware title down to two pages. The hardest part of training, solved. Save Time and Money with courseware. The idea behind courseware is simple, we've written courses for you. You can edit them; you can modify them you can even rebrand them as your own. We've done the hard work of researching and developing the content taking careful attention to the quality and relevance of each courseware title we offer you. Each course is tested in the classroom and proven to be effective in any training or workshop environment. Plus, you have the unlimited rights to make any changes you want to the content in order to fit your training requirements and organizational needs. All the hard parts of courseware, solved. Save Time and Money with Courseware. The idea behind courseware is simple, we’ve written courses for you. You can edit them; you can modify them you can even rebrand them as your own. We’ve done the hard work of researching and developing the content taking careful attention to the quality and relevance of each courseware title we offer you. Each course is tested in the classroom and proven to be effective in any training or workshop environment. Plus, you have the unlimited rights to make any changes you want to the content in order to fit your training requirements and organizational needs. eLearning version of this course for use in your LMS. Includes ability to customize the course for specific training needs. "You have a great product and I'm glad our paths crossed." "The package I purchased will allow me to grow my practice. The product you offer is amazing." "The way you have designed the materials makes this a very simple process... Thanks for helping make my job so much easier." "Since I was introduced to your soft skills training software, I must admit that I have reduced the preparation time by almost one half... I highly recommend your product to any serious trainer." "The programs are comprehensive and well planned. It is a complete turnkey system." I don't have an LMS yet. Is there still a way to use your courses? Good news! We have an LMS and would be happy to provide you with free access to this. Every Velsoft interaction is backed by real people with industry expertise dedicated to answering your questions and helping your business grow. We're here for you, talk to us!